Project Description: Make your room as clearly unique as you are! This easy to make Grafix Clear Craft Plastic door hanger is a great way to mark your space. Peel away blue liner from clear craft plastic and hole punch top corners. Cut out a 1×3” rectangle of metallic foil board or funky film. Adhere metallic foil board to craft plastic by using an adhesive runner. If using funky film, remove backing and apply directly to craft plastic. Cut out cardstock lettering with scissors or die cuts and layer on top of rectangle. 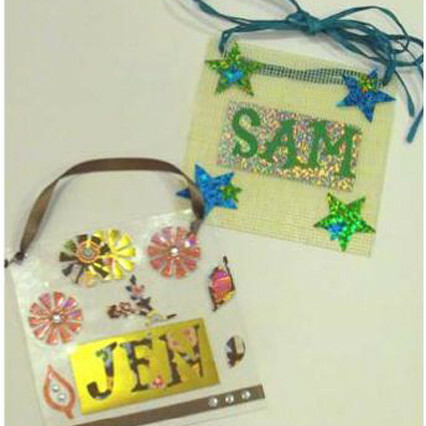 Decorate your door hanger with additional cut out designs or die cuts, ribbon, raffia, craft mesh and rhinestones. Add ribbon or raffia through the hole punches to hang.